Comic Boom! : 22 West Street, Keene, New Hampshire, USA. My path to Comic Boom! was a fetch quest started with a simple Google search. I was on vacation and looking for local stores. I didn’t know Comic Boom! or had ever been to Keene. I’m not a travel writer, but Keene was normal enough, surrounded by strip malls and endless 4 way stop signs. It was a hot day; we drove down anonymous side streets reminiscent of Streets of Rage and easily found Comic Boom! GPS is handy like that. First thing that strikes you on approach is; is this place open? A local hopped past me through the door, it was a clear sign of life. The windows were dirty and crammed with old marketing collateral that seemed to be piled ad hoc in the window. I’ve always thought; the less effort a store puts into attracting an audience; the more valuable it is to that audience. This is absolutely the case with Comic Boom! The second thing you notice is that the store looks like a good hold up in the event of the Zombie Apocalypse. It’s hard to tell if it hasn’t already been through one. In no way, are either of these facts a criticism, they’re a definite plus. Once through the door, it’s an explosion of boxes, shelving, comics, figures, Magic: The gathering cards, ageing promo posters, glass top counterspace, more boxes, trades, more boxes; Did I mention the boxes? Stopping you in your tracks is a well stocked new release wall; leading to two corridors down the sides of the back issue bins; lined at floor level by more boxes. Treacherous to the ankles; watch out! The depth of selection in both single issues, and trades is deep; one of the best I’ve seen. A tiny problem; the racking goes from shelf to floor box and back again (I think?) with little indication of where next, it’s a treasure hunt; I like that. Towards the back of the store, which is light and airy despite the dour exterior, are a raft of tables where a heated Magic: The Gathering event was taking place, is it too meta to call it a Gathering². Loud excited matches were being called from old printer paper. The trash talk was bubbling; the passion and antagonism enriched the store atmosphere. The store was filled with every type of comic reader, teenagers, dads, kids sat in the aisles reading Tiny Titans trades (clearly a fire hazard) with a side order of Magic fanatics. The place felt alive, excitable and visceral. I loved it. I set to work, I had a mental list, that quickly fell by the wayside as I browsed. My arms became overburdened to point where, I had to drop the first pile of titles on the counter. A tall friendly guy behind the counter gave me a genuine welcome; and a warm smile. “Not always, I know about 50%” he replied with a wry open expression. I went back to the racks, to track down Pride of Baghdad and stumbled across some Venom trades I didn’t know I needed; and returned to pay. The guy thanked and bid me farewell. I grabbed my daughters and lured them out of the store with the Tiny Titans trades they had fallen in love with, and stepped into the light and heat. 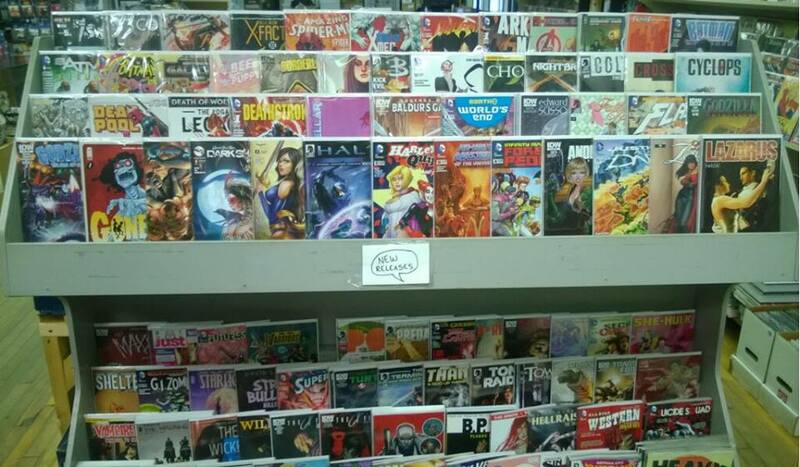 Comic Boom! 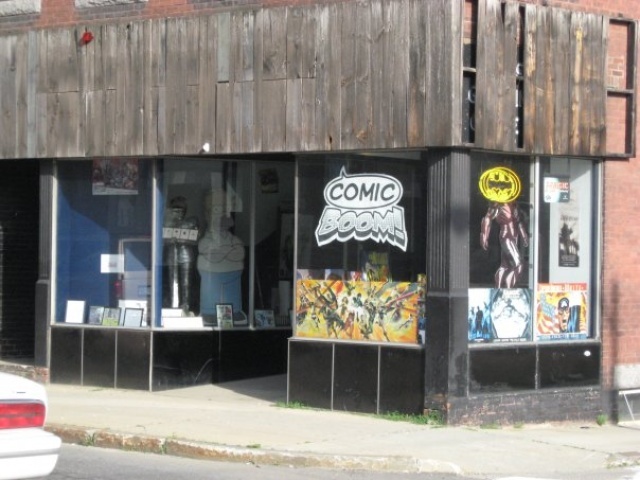 is everything you need in a comic book store, great selection, unique atmosphere and friendly staff. It’s either off the beaten track or your local favorite place, either way if there is anyway you can pay the store a visit, you should as its awesome! Their WordPress which hasn’t been updated since 2011 in keeping with their window displays. My favorite comic book store is Graham Crackers in Illinois. I have been to many of their locations- Naperville, St. Charles, DeKalb and Chicago on Broadway. Their employees are always very friendly & knowledgeable! Thanks for the comment, if I’m ever out that way I’ll definitely check it out!